Since 1979, ESI, Emergency Systems Inc. has been dedicated to designing and installing the most technologically advanced and affordable security systems available. All this and from the best domestic manufacturers. Our award-winning service makes us the logical choice for all your security needs. ESI employs only commercial grade security systems for office and home use. No “Big Box” sub-standard products that other security companies might use. We are constantly researching and exploring manufactured products coming on to the market, only selecting the most up to date, technologically advance, cost effective devices we can acquire. Cellular technology with multi-faceted, expandable systems, adaptable to any security need. Our highly trained security technicians, design custom security applications to accommodate any individual need or areas of concern, lifestyles and budget. We specialize in inspecting, repairing and replacing out-dated security equipment, giving you a level of protection to withstand breaches and intrusions. All security components are UL listed and chosen based on their performance, quality and false alarm immunity. With all the new enforcement regulations concerning false alarms triggered, we provide peace-of-mind security alarms that are both verifiable and affordable. We even have the new product called Videofied, a motion detector equipped with a real-time video feed, that enables law enforcement to respond to a verifiable alarm in progress. ESI's expert installation technicians, professionally inspect and install both hardwired and state-of-the-art wireless systems for every application in high-end homes, commercial space, industrial complexes and property surveillance. Our security products inventory and expertise includes every security application: fire alarms, sprinkler systems, burglar and intrusion devices, silent alarms, panic alarms, access controls, internal and external video surveillance; including video feed motion-detectors, CCTV’s, gate operating devices, monitoring and much, much more. Residential alarm system upgrades starting at $151.00. Includes DMP 10 Zone control panel, power transformer and one 7360 icon keypad. These services are subject to change and other restrictions may apply. Term agreements may be required. New Residential XTL Wireless Alarm System Starter Package with GSM/Cellular Communicator. No land line needed! Includes control panel, keypad, sounder, two window door sensors, one motion detector and GSM/cellular communicator. Installation includes a onetime charge of $510.00 plus a $18.95 per month monitoring and $8.00 per month GSM carrier fee. 36 month monitoring agreement required. Commercial alarm system upgrades starting at $181.00. Includes DMP 10 Zone control panel, power transformer and one 7060 thin line keypad. Keep your home safe from burglars, robberies and invasions. Home Invasion is a term that relates to a criminal act of someone crashing through an entry door, into an occupied home, catching the people inside completely by surprise. This technique makes it virtually impossible for someone to make a 911 call or trigger an alarm. This is a traumatizing act, perpetrated by motivated and dangerous criminals, that in many cases cause the victims injury and sometimes death. Many communities are subjected to these types of crimes being committed and not just in poorer neighborhoods. Because these acts constitute a criminal abduction, and carry substantial sentences, many are perpetrated in finer homes and older residents are being targeted at unprecedented rates. A properly designed and installed burglary alarm system from ESI can easily be transformed into an intrusion alarm, by simply arming the system when the occupants are home. We recommend that our customers keep doors and windows locked at all times. Adding a level of security protection like CCTV’s (closed circuit tv’s) can discourage a would-be intruder and help to prevent crimes like these from happening. 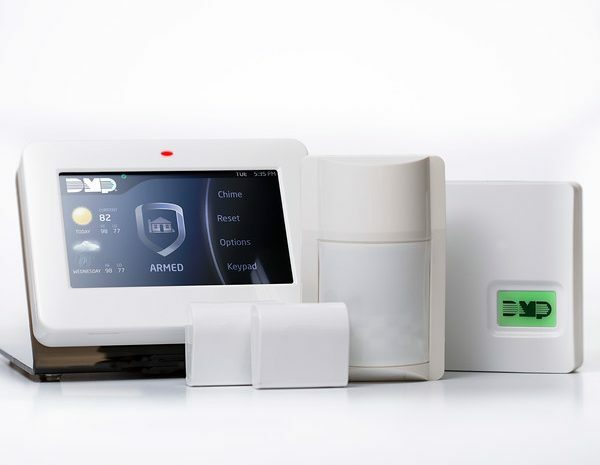 These systems are relatively affordable and we encourage, especially our high-end residential customers, that they employ layers of security protection to meet any security breach or intrusion. The modern, commercial grade security systems that ESI utilizes, has a "Home" and "Away" mode. The "Home" mode automatically arms the perimeter alarm devices (doors & window contacts) and by-passes the interior alarm devices and motion detectors. The occupants are then free to move around the home without fear of intrusion and of course setting off the alarm. Should an intruder crash through a protected door or window, the alarm would automatically sound and the monitoring station and authorities would be immediately be notified that a verifiable alarm is in progress. Protection and safety provided by one of the most affordable and industry recognized leaders in home security systems. Many large, residential security alarm companies, employ unsophisticated, non-commercial grade security systems that can be costly to purchase and install. In some cases, these out-of-date products, uses technology that only provides limited protection. Today’s modern criminals have become experienced enough to overcome many of these systems and gain access to a dwelling. Many “Big Box” stores like Lowes and Home Depot sell non-commercial grade, do-it-yourself home security systems. These sub-standard, security applications are in most cases not expandable and offer limited protection. ESI specializes in providing only cost effective, commercial grade security products that will last years, utilizing the most up-to-date technology at affordable prices. All of our security technicians are specialists in designing and installing the right security system to fit your individual needs and budget. Give us a call today at 904-388-3975.